Production | Crews | Sourcing | Props & HUDs | Locations | Building Sets | Shoots | Join in! Your own avatar or Alt(s) can play one or more characters. The key to making a character is organising your inventory properly, so that after you find the right combination of body parts, clothing and attachments, you can reload that combination for a future use. Otherwise, even if you get the same combination again, it might take some time to find it! Figure 1 at right shows one of the Seconds Crew's inventories, and in particular the character sets used for Return to Second Life. Some of those sets will overlap with identical sets with other avatars/alts (e.g. Both Laurel and Optimum both have "Laurel 1" sets), so that the avatar/alt can stand-in for that character when the other avatar/alt isn't available. This is usually when either they can't make it to a shoot, or they're playing a different character. Creating a character means finding the right combination of body parts, clothing, and attachments, and creating an outfit. This is a basic expertise in Second Life and Open Simulator. If you don't don't how to mix and match, and modify what you wear, please read Inventory, Advanced inventory management, Controlling your avatar's appearance, Saving your avatar's appearance with outfits, Avatar Attachments, and Finding lost objects and attachments. Where possible, use a link to to item before using the original or copy. The issue with renaming comes from being able to re-source a purchased item for other avatars or alts to use. Suppose your original item is named something like Cheap Joe's Red Wig and when making the outfit name the new outfit Character 4 basic. If you rename the all the items that make up that outfit (which is still an option in some Version 1 viewers) then it might be renamed to Character 4 basic hair. This is all very well if you never need to make another outfit with it, or no one else needs duplicate that character, but it obscures who created it or where you got it from. By using a link instead of an original or a copy, it makes it much easier to make variant outfits for a particular character. Figure 3 at right shows the result of adding the items. So why have a separate Clothes folder underneath the Explorer Kit folder? It allows you to set up other sub-folders such as Hair, Climbing Equipment, Water Equipment, and so on. In each sub-folder you add the items that are appropriate for that dedicated look. Hair for example might have a range of hair attachments showing different types of ruffled hair, climbing might include ropes and a pick. In this case, the Extra Kit folder below the Clothes folder contains a jetpack and a huge light, which might not be appropriate for all scenes Dr Optimum appears in. Suppose you've made a mistake and you don't want to use the Explorer Kit, but the ExitReality Kit instead? The first thing you need to do is remove the wrong items. There are two ways to do that. 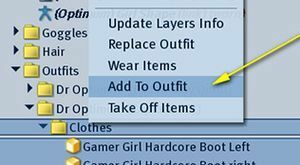 Firstly you can select the Clothes folder again, bring up the context menu and select Take Off Items instead. That will remove any items in that folder. Secondly you could instead select the Body folder, bring up the context menu and select Replace Outfit. The difference between these two ways is whether or not you want to remove items added by other means. Each copy of the goggles is worn on the same attachment point - the nose.When one is worn it will detach either of the other two if they're already worn by the avatar. This won't work if you have multiple attachments allowed for each attachment point, so you'll need to turn that viewer setting OFF. Also, when buying items it's important to make sure the permissions are correctly set. Avoid Copy Modify Transfer items unless it's exactly what's needed. An item that's Copy Modify Transfer can at least be repositioned on an attachment point, and one that's Copy Modify Transfer can be used with the above technique. An NPC is a copy of an avatar's appearance, which can be rezzed when needed. See NPC maker for OpenSim at OutWorldz for details on this. The point is that each NPC is a snapshot of what an avatar is wearing at the time it's created. So, the same techniques show above still apply, but to the avatar about to create the NPC, not the NPC itself. As that's the case, it's easier to create a new NPC for each version of a character that you need. Each created character can be later edited to be moved and posed correctly. If you make a mistake, it's easy enough to delete an NPC and start agin.